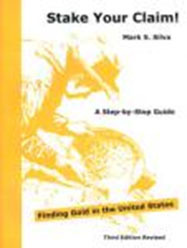 Stake Your Claim Book is a step by step guide to owning a gold mine. Tell you everything needed to know to research, locate and file your own placer or lode mining claim. Detailed step-by-step instructions walk you through the entire process. Forms are included.